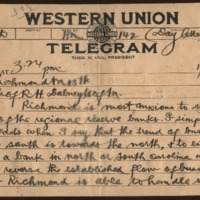 TO Prof. R.H. Dabney, U of Va.
Richmond is most anxious to secure one of the regional reserve banks. I simply state facts when I say that the trend of business in the south is towards the north, & to establish such a bank in North or South Carolina would be to reverse the established flow of business. That Richmond is able to handle such a proposition is evinced by the fact that the bank clearings here exceeded those of Norfolk & Atlanta combined until the state of Gerogia cleared through Atlanta. Won't you please get in touch with President Wilson & see what you can do. It means a great deal to Virginia & it is needless to say how much we will appreciate your efforts in our behalf. Virginia does not want to be included in the region to the north of us. You can well understand this. Pinckney, Charles Cotesworth, 1875-1934, “Charles Cotesworth Pinckney to Richard Heath Dabney,” 1914 January 13, WWP20497, University of Virginia Woodrow Wilson Letters, Woodrow Wilson Presidential Library & Museum, Staunton, Virginia.